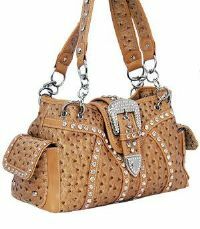 Tan Ostrich Style Designer Bag Decorated with Clear Rhinestones. Dual Shoulder Straps with Chains & Adorned with Studs & Rhinestones. Dual Side Magnetic Snap Pockets Adorned with Silver Studs. Back Zipper. Zip Top Closure with Magnetic Flap Decorated with Rhinestone Western Buckle Set. DO YOU WANT PACKAGE INSURED?